Looking to add energy-efficiency features to your cabin? Make sure you know the facts. Myth: Solar hot-water heaters can only produce so much hot water per day; it won’t fulfill my needs. Capturing enough solar energy to meet your hot-water demands is less an issue with the concept as it is with the design — namely what calculations were taken into account to determine the solar power required. He also recommends using a backup source. (Electricity or gas will work, with the latter being the cheaper of the two options.) That way, even if you have guests or an extended period of overcast skies, you won’t run out of hot water but will still be producing it for free the majority of the time. Myth: Geothermal systems don’t work. One bad experience can often cloud a homeowner’s judgment on the effectiveness of a particular system — especially one as complex as geothermal air-conditioning. Poor functionality, in this case, is usually the result of an undersized or shallow system. One example he came across was a 5-ton system for a 2,500-square-foot home that ended up heating the earth to 118 degrees, instead of maintaining a constant 72 degrees, over a four-year period because it was undersized. “Consult a qualified design loop engineer to get it done,” Dean cautions. Myth: Geothermal systems aren’t worth the cost. Upfront costs for a geothermal system are typically 2.5 times that of a standard HVAC system, Dean notes. “But payback on [the system at current rates in] a new home is five years and, in a retrofit, three to four years,” he adds. That’s because of the way it operates. Geothermal systems use a heat sink — utilizing the constant temperature of the earth at about 300 feet below the surface to cool or warm water in a closed-loop system — to condition the home. Because the system does not have to work as hard to close the temperature differential, it only consumes 15 to 20 percent of the energy that would be expended in other systems — and tends to last longer, too. “The typical lifespan [for a geothermal system] is 40 years instead of 10 to 20 years for a standard heat pump,” Dean states, adding that, as heat pumps age, they operate at a fraction of their initial efficiency in extreme temperatures. “Geothermal does not experience that degradation,” he adds. So, even though you’re spending more upfront, in the long run, it’s probably worth it. Myth: Foam is bad for indoor-air quality. Spray foam is a great insulation solution, but many homeowners are worried about outgassing and humidity. The latter can often be blamed on an oversized HVAC that causes condensation in your ductwork rather than the foam itself. “Many HVAC contractors don’t know how to compensate for using foam in the [thermal] envelope,” Dean explains, so the unit installed will produce more moisture during the cooling season than the home is capable of removing. Outgassing is more a matter of preparation. There are two types of foam: a polyurethane foam mixed with an agent that causes it to foam up like Styrofoam, and a vegetable-based foam that uses polyurethane glue. Both provide the same insulation; it’s simply a matter of how much time is needed for the chemicals to release. The former will outgas over a couple of days, Dean notes, while the latter only outgasses for 24 hours until the glue dries. Myth: Light-emitting diode (LED) bulbs give off a weird bluish glow. With incandescent bulb distribution on the hook to be phased out later this year, homeowners will be turning increasingly toward more efficient options. But despite the noted efficiency and longevity of LED lighting, which has a life span of 30,000 to 100,000 hours depending on the quality of the bulb, its perceived coloring tends to keep it from being the first choice. LEDs have since been altered to emit a wider range of colors, expressed in degrees Kelvin, from that cooler white to the warmer glows to which most of us have become accustomed. 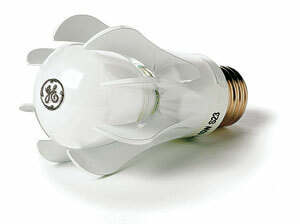 Another adaptation: Higher-quality bulbs are now fully dimmable, too.